A new movie is intended to shake large numbers out of their evolution-based complacency and hostility toward the God of the Bible. 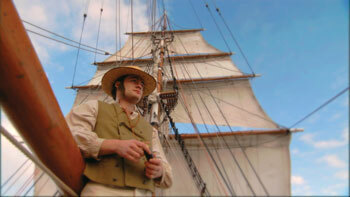 A scene from The Voyage That Shook the World showing a young Charles Darwin. This is the pre-publication version which was subsequently revised to appear in Creation 31(2):43–45. 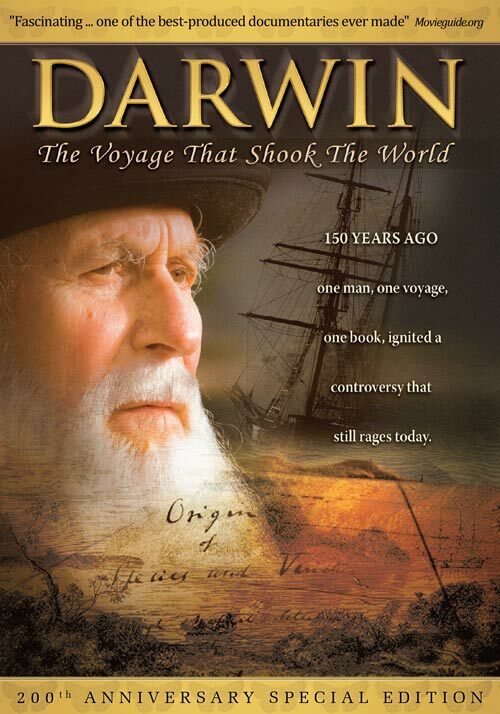 Planned to coincide with the 2009 Darwin celebrations, CMI’s high quality big-budget documentary movie, The Voyage That Shook the World, has now been released for international broadcast (the DVD version will be available later in the year). Produced by our subsidiary, Fathom Media,1 using both inhouse and consultant professionals of a high level of experience and expertise, the film is framed around a retracing of Darwin’s voyage on HMS Beagle. The primary purpose of this 52-min high-definition ‘docu-movie’ is to move the creation/evolution debate into the secular mainstream and to break down some of the seemingly impenetrable barriers of evolutionary prejudice. The Voyage has been produced with world TV networks in mind and their viewing audiences of millions.2 Follow-up DVD sales to believers to use with their non-Christian connections could then add greatly to the numbers potentially reached. 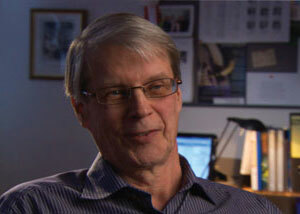 One veteran TV producer has said, ‘You can’t tell people what to think, but you can tell them what to think about.’ Using this maxim, we have created a thought-provoking documentary designed to communicate and appeal to secular as well as Christian audiences—to crack open the mindset that ‘everyone knows’ that Charles Darwin was right about evolution, that all the facts support it, and so on. In walking that fine line while crafting the film, we had to beware of leaning too far in either direction. To be avoided, for example, was allowing it to be too-readily written off as pitting “blind faith” against science. On the other hand, we did not want it to be a watered-down mush that offered no real challenge to secularists to rethink anything. At the same time, too, it could not simply be a ‘middle ground’, giving comfort to those who push for a compromising idea that blends a little from evolutionism and a little from Christianity. And of course, while an overt preaching of the Gospel would preclude it from getting to where we wanted it to go, we wanted not the slightest hint of being ashamed of God and His Word. The Voyage manages to challenge ideas of ‘millions of years’ without triggering the immediate reaction that a young-earth presentation would have on most secularists today. We are all immensely grateful to the Lord that by His good grace, the movie has not just met, it has greatly exceeded expectations in finessing that difficult terrain. ‘Stunning’ is a phrase that came to the lips of many who first saw the raw footage and the early drafts in terms of its wonderful photography and technical excellence. More importantly, its thought-provoking approach issues a challenge to secularists that is somehow stronger because it does not permit them to take refuge behind their convenient caricatures of Bible-believers. For example, the film does not engage in gratuitous ‘Darwin-bashing’. This complex individual is treated with dignity. He was in fact right about a number of things. Dr Janet Browne (Darwin historian of Harvard University), Dr Peter Bowler (Professor of the History of Science, Queen’s University, Belfast—filmed in the very room Darwin occupied at Cambridge), Dr Jan Komdeur (Professor of Avian Evolutionary Ecology, University of Groningen), Dr Phil Currie (paleontologist and dinosaur expert, University of Alberta), Dr Sandra Herbert (geology historian, Library of Congress), Craig Buckley (zoologist, Cambridge University) and Dr Bryan Milstead (head of research, Darwin Research Station in the Galápagos). 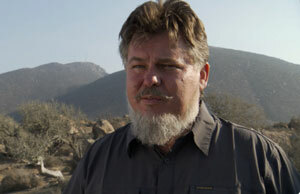 The biblical creationists include Dr Emil Silvestru (geology, CMI-Canada—Emil first mooted the idea of such a documentary), Dr Robert Carter (marine biology/genetics, CMI-USA), Dr Stuart Burgess (Professor of Design and Nature, Bristol University, UK), and Finnish professors Dr Matti Leisola (biochemist) and Dr Tapio Puolimatka (philosophy). Also featured are biophysicist Dr Cornelius Hunter (author of Darwin’s God and prominent in the ID movement), as well as renowned Christian philosopher Dr Alvin Plantinga. The fact that the project would be dealing with the controversy was disclosed to each interviewee in advance. We believe their views have been fairly and respectfully represented, and we are grateful to all interviewees for their important contributions. Interestingly, some of the most telling statements came from the lips of the evolutionist experts themselves. For example, Darwin’s racism; his tendency from an early age to invent big imaginary stories; and the way in which evolution, by undermining Genesis, destroys the foundations of Christianity in general, including the doctrine of salvation. Also, a powerful statement from a scientist on how scientists can be locked in by their worldviews such that their minds are closed to other possibilities. In one revealing interview, the Head of Research at the Darwin Research Station discusses the ‘surprising’ things happening on the Galápagos. For example, finches’ beaks changing very rapidly under selection, cycling back and forth, from big to small and back again. 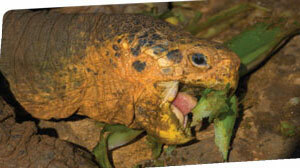 And then something that should not have happened—the recent finding of a hybrid between marine and land iguanas (cf. p. 28), two totally separate genera in evolutionary classification (yes, we got good footage of this creature, too). In addition to critically examining the personal and historical background to Darwin’s life and ideas, The Voyage goes much further. It dares to ask whether the ideas themselves stand up in the light of modern science. And it is, crucially, unafraid to grasp the nettle about the strong religious and philosophical implications of Darwin’s idea. Another thing that will likely set it apart from the other Darwin movies scheduled for this year is that it highlights the fact that Darwin saw himself early on as more of a geologist than a biologist. His ‘Bible’ on the voyage was Lyell’s Principles of Geology, which, as prominent geology historian Sandra Herbert reinforces in the film, was written to destroy the idea that Genesis was real history. One of the key themes of the documentary is whether Darwin would have reached his conclusions if he had known what we do today. As we revisit the sites Darwin saw, we find repeatedly that his conviction about Lyell’s ‘deep time’ (so crucial to Darwin’s theory) is not scientifically sustainable. One of the key themes of the documentary is whether Darwin would have reached his conclusions if he had known what we do today. For example, Darwin believed that the Santa Cruz river in Argentina must have been carved over millions of years by the sea. Had his expedition reached the source of the river, he would not have seen what he expected to confirm his views. Instead, he would have seen a huge glacier, a remnant of the Ice Age that is now believed to have carved the river valley—rapidly, via catastrophic flooding! Then there are the upright fossil trees he thought had grown in place and been subject to slow up-and-down movement of the land over millions of years. The documentary examines these trees in the field, revealing definitive evidence that they did not grow in place at all, but were torn off and deposited catastrophically. Designed for modern secular audiences, The Voyage has deliberately avoided a polemical path in favour of a thoughtful questioning approach. The historical framework in which the film is set also allows it to make bold reference (often from the mouths of secular science historians) to Genesis, the Flood, recent creation, our descent from Adam and Eve—but in such a way as to add to the assembling jigsaw without the sense of having things rammed down the viewer’s throat. The viewer is taken on a thinking ‘voyage’, that clearly indicates Darwins’ theory of evolution has not resolved the issues—subtly challenging the viewer to consider the Bible’s account as being the better explanation, after all. Of course, there are huge barriers of evolutionary prejudice to overcome, but it will not be for lack of quality and content. Evolutionists may at first try to ignore The Voyage, to deny it the oxygen of publicity. If this becomes too difficult, the next phase may be to seek to discredit it, perhaps even via special broadcast ‘counter’ presentations. Pray that all such efforts will rebound, and that any controversy generated will spur on even greater numbers to actually check out for themselves The Voyage That Shook the World. Pray, too, that having done so, many of them will start to investigate more and more the real facts behind this false philosophy that is hindering millions from considering the claims of Christ upon their lives. Click here to watch the trailer of the film, and news on TV broadcasts, etc. throughout this year and beyond. This allowed us more freedom to approach the places and people we wanted to film and be judged on the merits and the aims of the project, without being discriminated against on the basis of our name. Return to text. Movies intended for cinema screenings are generally required to be about 90 minutes at least, which makes them less suitable for TV broadcast. Return to text. See <creation.com/erasmus>. Return to text.